The above shows the application collaborator graph. The letter (S/R) in the corner designates object lifetime; either Singleton or Request scope. Now, just to be clear, there is nothing wrong with having a single instance of a class. The problem arises only when the singleton is available through a global “instance” variable as in Singleton.getInstance(). Now, in order to have a testable codebase we have to make sure that we don’t mix the object construction with application logic. So all of the above objects should rarely call the new operator (value objects are OK). Instead each of the objects above would declare its collaborators in the constructor. AuthenticatorPage would ask for ChargePage and Authenticator. ChargePage would ask for CreditCardProcessor and UserRepository. And so on. We have moved the problem of construction elsewhere. The problem of “how do I ensure that I only have one of something” is nicely sidestepped. You instantiate only a single ApplicationFactory in your main, and as a result, you only instantiate a single instance of all of your singletons. Now the factories become largely a series of object creations. Totally boring stuff, so boring a computer could generate the code. Simply look at the constructor and recursively instantiate whatever the constructor wants. Wait, a computer can generate it! Its called PicoContainer or GUICE! So you don’t actually have to write the factories. Thanks for this article. I’m allegedly an experienced developer but I was fuzzy in my understanding of this and you’ve helped me out tremendously. Nice job! How would you answer the question of whether database connection pools should only be instantiated once, hence be a singleton? Or any kind of pool like a thread pool object pool, etc. What tool did you use to make those diagrams btw? I’m looking for a decent tool for making various diagrams for my code. How exactly does the HTTP request get a reference to RequestFactory? Very nice article… Thanks a lot for the excellent explanation. It’s fine if I use the ApplicationFactory to get my object references, but I can easily break the singleton lifetime and instantiate a new Database, OfflineQueue, CreditCardProcessor and CreditCard myself, no ? No, because you must not use ‘new’ operators in your business objects (everything is not a factory). But you can use ‘new’ in tests. I am going to echo the issue brought up by Michael, and point out that the servlet will still need to access a global variable (or a singleton) to get the instance of RequestFactory. For clarity’s sake you should indicate this, since you cannot create the servlet via a modified constructor that takes a RequestFactory object. So the overriding design principal, as stated, is broken at this one point in favor of a simpler approach. you may look at http://misko.hevery.com/2009/04/08/how-to-do-everything-wrong-with-servlets/ to see why servlets are a problem. It glosses over how the servlet gets the reference to the RequestFactory. I only mention this because if someone comes to this post and is learning why they shouldn’t use singletons for everything, they will get stuck wondering how to jump through that final hoop. Now, while I personally don’t like using servlets, there is a way to give them a dynamic context by using an synchronized initialization servlet that puts an Application instance into the ServletContext. 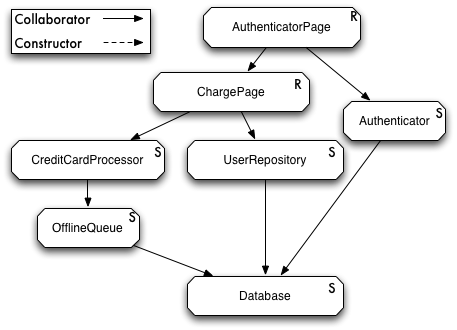 This Application object would hold / provide all of the application necessary configurable objects (offline queue, authenticator, requestFactory, etc). For testing, the instance of the Application object can be changed with a different class that provides a different implementation, so you would have your TestApplication instance to replace your ProductionApplication instance. This still doesn’t make code that is embedded inside servlets easy to unit test though, since you still need the servlet container. I have never used the design I have just mentioned, so I am not sure if it has serious problems or not, but it would be easier to refactor to if someone is migrating an existing Servlet based application (easy enough that it seems like a free way to remove singleton dependencies that would be easier than replacing an existing apps use of servlets all together). If you write focused tests and remove duplication mercilessly, then the code to instantiate collaborators will naturally move up the call stack to the entry point of the application, completely removing the need for singletons. The entry point becomes Miško’s Application Factory. I can’t quite get how this is the case from the example presented. As @Trevor hypothesized, I’m a bit confused on the last step. Is it because you needn’t pass Database, for example, to AuthenticatorPage so it can pass it on to Authenticator? 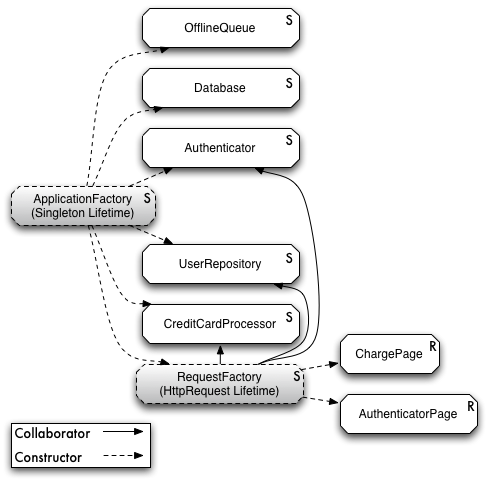 Instead the application startup gives these dependencies to the Factory which injects them behind the scenes when AuthPage requests an instance of Authenticator? If so, won’t it be the case that you’ll be passing the Factory instance around everywhere? How is that any better?